3 bed, 2 bath, 1500+ Sqft, Quiet Neighborhood, Families and Pets Welcome! Furry friends welcome! Perfect for families who want a home away from home. Respite for weary business travelers. Easy access to both I-70 & I-270. Take your shoes off and relax in our 3 bed, 2 bath, split level, 1500+ sqft house, with fenced in backyard, garage and grill in the backyard. Also includes: Easy access with key code entry; Internet/WiFi; Cable TV with a 42” flat screen; Outdoor deck with a patio in the back; charcoal and propane BBQ grills; Walk out basement; Fully fenced in backyard; Washer/dryer; Basic toiletries such as shampoo, conditioner and body wash; Finished basement; Coffee machine - a must! The house was built in the 1950's and has been updated. Most of the electrical outlets throughout the house are 2-prong, however there are several locations (kitchen, both bathrooms and the downstairs hallway) that do have 3-prong outlets. We have a power strip downstairs by the television for people to use. If you need an extension cord for your stay, please don't hesitate to let us know and we'll gladly bring one over. You will have the entire house to yourselves. For parking, you are welcome to use the garage - the code to open the garage door is inside the house in the house manual. Two cars can fit in the driveway and there is also additional street parking available. There is a storage shed in the backyard that you will not have access to. Feel free to contact us as often as necessary. We live nearby and are available if you need us for anything. We're happy to say "hi" and make local recommendations. The house is located on a quiet cul-de-sac in Maryland Heights. Within walking distance to a small local park. 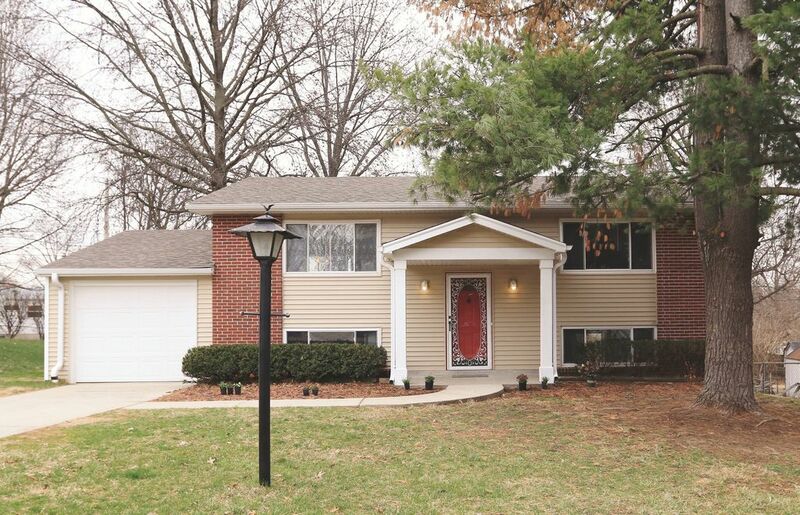 Close to the new Maryland Heights Community center and Aquaport. Grocery store, small shopping center and plenty of restaurants are less than 2 miles away. While all the basics in the kitchen are provided (i.e. coffee maker, toaster, microwave, dishes, silverware, pots, pans) there are limited staples provided for your convenience. We have coffee, tea, basic spices, ketchup, mustard, mayo, margarine. You are welcome to bring whatever food you need to make your stay like home. We have shampoo, conditioner, and body wash in the shower in each bathroom. It's a split level house. Thank you for sharing your comfortable, roomy home with us. From leaving the treat for our dog and one for us - to the complete list of restaurants and nearby places to visit - we felt very cared for. Nice clean convenient stay! Had everything we needed! Thanks for the kind words! You would be welcome back! This house is awesome! Very large, could have taken double the number of people we took! Very nice split level with a living room, kitchen, bathroom and 2 bedrooms upstairs and a bedroom and living room and bathroom downstairs. Very nicely decorated with plenty of couches and loveseats to lounge around and watch TV. Kitchen well-stocked and refrigerator has ice and water in the door and an ice maker. Great location and overall great place to stay! We were in St Louis for a memorial service, so no time to see the sites. It was perfect for 5 of us and a baby. It's very clean and decorated beautifully. I'd stay there again. We have a big family, 8 of us, this house accommodated all of us comfortablely. Was clean and had everything you needed. Close to all the popular attractions in St. Louis. Neighborhood was safe. I would recommend this property to friends. 8 of us guys came down to St.Louis area for the 2018 PGA Championship on Saturday. Matt and Tammy's house worked perfectly for us. A good sized living room area downstairs to watch TV and play cards. The house was in a secluded quiet cul de sac which we preferred. It was close to a golf course we golfed on Friday. The Hollywood Casino was a quick 5 minute drive for us as well. Thank you Matt & Tammy! !